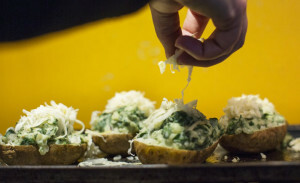 The potato and greens mixture, scooped into potato shells, is heaped with cheese (above). The finished potatoes, just out of the oven the second time (left). The potato and greens mixture, scooped into potato shells, is heaped with cheese (above). The finished potatoes, just out of the oven the second time (left).